This handy piece of schooling equipment may be small, but it carries its weight in gold. The Instant Gag, was designed with Olympic Medalist, Anne Kursinski and is used to turn any bit into a gag bit without the hassles of changing, matching or sewing cheekpieces. 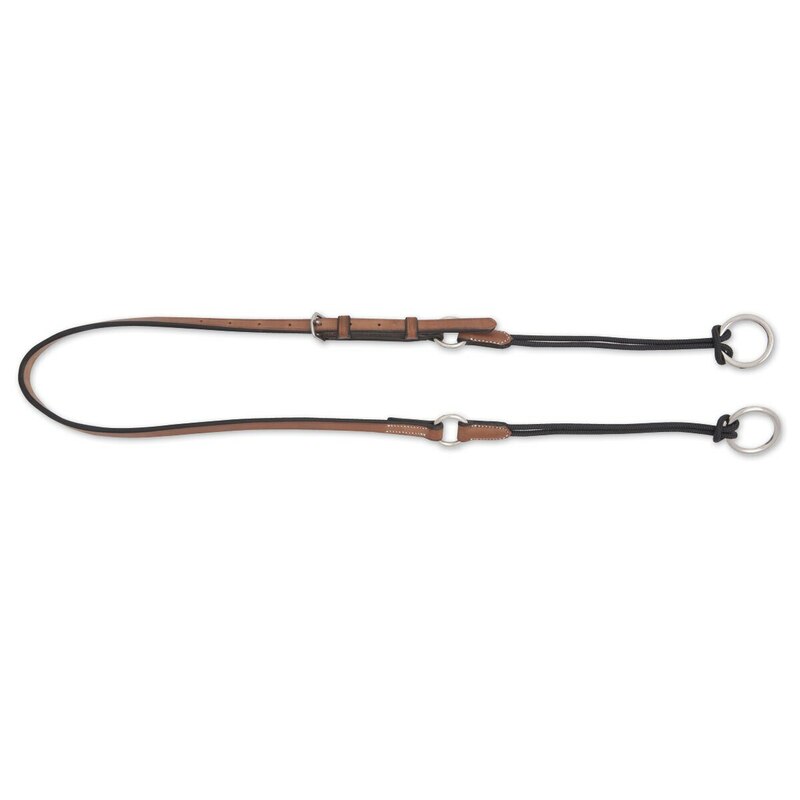 The instant gag goes on any bridle either over the crownpiece or under (like a bradoon), leaving the rope/rings to slip through the bit ring and attach to either the snaffle rein or a second rein of the riders choice. Easy on/off and most important is the safety factor. With this piece there is never a need to remove the bridle's original cheekpieces. Therefore, if the rider's bridle should fail, the bit will still be held in the horses mouth by the instant gag. Arc de Triomphe Instant Gag is rated 5.0 out of 5 by 5. Rated 5 out of 5 by KSHunter from Great for sensitive horses Purchased because my horse is usually ridden in a Happy Mouth Mullen bit and when I tried other bits with gag cheek pieces it was too strong for him. This gag allows me to keep using my gentle happy mouth mullen bit but gives me just a little extra leverage if he gets strong on course. Rated 5 out of 5 by Roisin from Great gadget! This purchase is working out really well. I am able to use various mouthpiece options vs. spending significantly more money on a single rope gag bit. Rated 5 out of 5 by eventer89 from A tack trunk must have! This is hands down the easiest gag I have ever used. Super easy to add to any bridle, super easy to use, and it works just as effectively as other gag's. I borrowed this from my friend for a lesson, and I will definitely be adding one to my trunk for those days when I just need a little extra help. Her's has darkened well with use and regular care. Its definitely the easiest option I have ever seen for gag's and it is fantastic quality on top of that! Rated 5 out of 5 by Petalstorm from Handy Piece of Tack This is a quick and easy way of getting the effect of a gag without having to switch everything out. It is very well made however I wish the leather darkened a bit better so that it would blend in better with my bridle. I like it and use it regularly. Rated 5 out of 5 by Lila from Great for Strong Horses I have a 5yo Clyde/TB cross. She gets strong (and sometimes spooks) when on trail, but I love my (expensive) KK full cheek snaffle. The Arc de Triomphe Instant Gag is perfect. I use two reins and still can have control while using my favorite bit. GREAT IDEA!